The extraordinarily nice French flatmate left for a sojourn in Argentina, so for now I am living with a wise-cracking American. We have frequent arguments about pronunciation (thorough, amenities, flaw) and lexicon (ice-lolly/popsicle.) If I risk winning, she plays the ace up her sleeve. The British are terrible because colonialism. My trump card is normally, I cook for you. Besides that, we have a nice system going on: a box of grocery money that we top up each month. We go the market for exorbitant amounts of fruit and veg. I make packed lunches for our respective workplaces and she does the washing up. From our market haul last week we had tabbouleh full of fresh herbs; roast vegetables and coriander hummus; spicy lime chicken; and cauliflower soup and boiled eggs with faces drawn on them in felt-tip pen. The strawberries though, at three punnets for one euro, unsurprisingly started going bad about half an hour after we brought them home. Beware a bargain. So the next day I bought a litre of vodka for my favourite summer drink, having finally run out of the stash in the freezer. Hulled and halved the berries, throwing away the mouldy ones. The rescued strawberries bobbed in their alcohol bath at the back of the fridge. Hull the strawberries, remove any bad bits and halve any large berries. 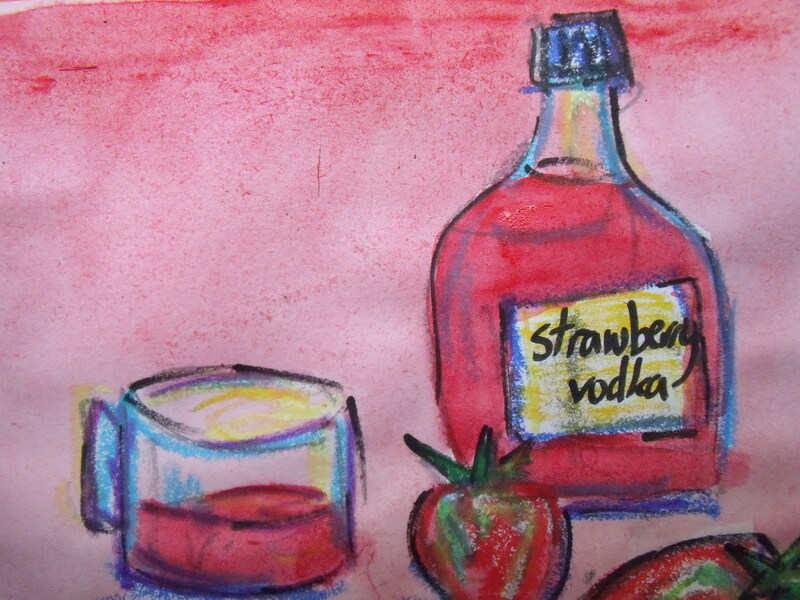 In a large plastic container, leave strawberries and vodka to steep for 3-5 days in the fridge. Strain the liquid into jars and keep in the freezer. Heat the remaining berries with sugar, lemon and pepper in a medium saucepan. Bring to the boil, turn down the heat and let simmer for 5 minutes. Cool, then blend. Pour into ice-lolly moulds or for a DIY version, half-fill plastic cups with the liquid then when half-frozen, push in the wooden lolly sticks. Or freeze in ice cube trays. Either add toothpicks later for mini lollies or blend into new and delicious summer cocktails.